Travelers are voting Knesset Eliyahoo Synagogue and Gate of Mercy Synagogue as the best synagogues in Mumbai. There is 1 synagogue in Pune a city just 148 km from Mumbai. The most popular of these is Ohel David Synagogue in Pune. You can find 3 synagogues in Maharashtra and 9 synagogues in the country of India. Our members favorite in Maharashtra is Knesset Eliyahoo Synagogue and Pardesi Synagogue is the top pick in India. Want more? Check out our map of synagogues in Mumbai. 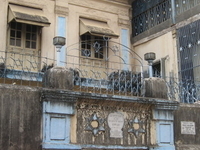 The Gate of Mercy Synagogue (also known as Shaar Harahamim and Juni Masjid) is the oldest synagogue in Mumbai (formerly Bombay), India.